We work hard and we play hard, and it's no secret we millennials like our booze with some games. Salt Lake's business district of Sector V may be spoiling us for choice with a string of pubs and bars lining the hood, but Hoppipola's new outlet is where we are popping in with our crowd. You needn't jump on puddles to chase fun like a child anymore. When fun is on the cards then Hoppipola is what our GPS usually chases ('Hoppipola' literally means this, in case you didn't know already!). The one in Acropolis Mall may top our chart, but when it comes to pub games and hip vibes we're fine to travel the distance and find a spot in their newest outlet in Salt Lake's Sector V.
Everything is an improvement in this new sprawling bar - from the zany pop-coloured iron-cage stools that are filled with coloured pebbles to the snazzy fun vertical games that take up the wooden walls of your booths. Industrial set up drunk on psychedelic colours and uninhibited ramblings, Hoppipola's different zones (private, dance and play) make it good to hang with bae, buds and the office gang. 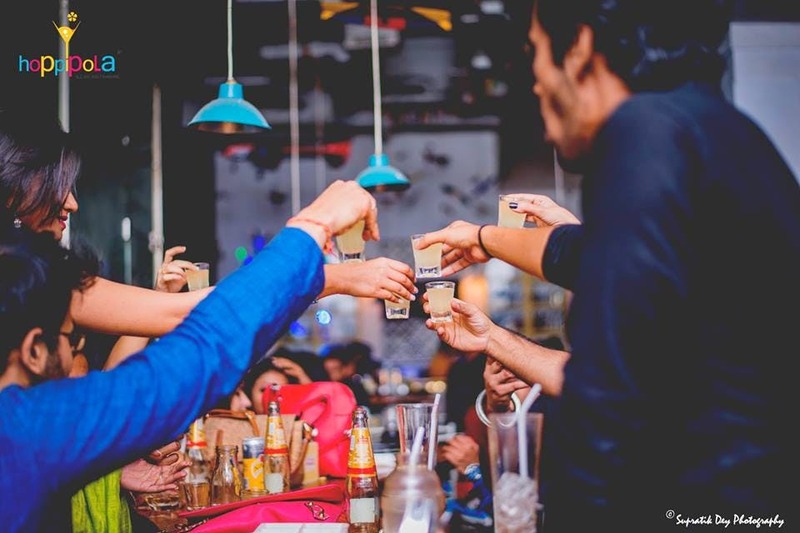 The scrummy pub grub of world cuisine makes the journey to Salt Lake worth the while, and the extensive shots menu (starting at just INR 95) will get you tipsy just right.